For similar terms, see Solfeggietto and Solfege (manga). In music, solfège (UK: /ˈsɒlfɛdʒ/, US: /sɒlˈfɛʒ/; French: [sɔlfɛʒ]) or solfeggio (/sɒlˈfɛdʒioʊ/; Italian: [solˈfeddʒo]), also called sol-fa, solfa, solfeo, among many names, is a music education method used to teach aural skills, pitch and sight-reading of Western music. Solfège is a form of solmization, and though the two terms are sometimes used interchangeably, the systems used in other music cultures such as swara, durar mufaṣṣalāt and Jianpu are discussed in their respective articles. Syllables are assigned to the notes of the scale and enable the musician to audiate, or mentally hear, the pitches of a piece of music which he or she is seeing for the first time and then to sing them aloud. Through the Renaissance (and much later in some shapenote publications) various interlocking 4, 5 and 6-note systems were employed to cover the octave. The tonic sol-fa method popularized the seven syllables commonly used in English-speaking countries: do (or doh in tonic sol-fa), re, mi, fa, so(l), la, and si (or ti), see below). There are two current ways of applying solfège: 1) fixed do, where the syllables are always tied to specific pitches (e.g. "do" is always "C-natural") and 2) movable do, where the syllables are assigned to scale degrees ("do" is always the first degree of the major scale). Italian "solfeggio" and English/French "solfège" derive from the names of two of the syllables used: sol and fa. 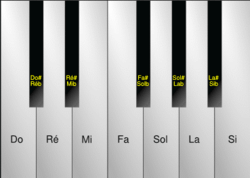 The generic term "solmization", referring to any system of denoting pitches of a musical scale by syllables, including those used in India and Japan as well as solfège, comes from French solmisatio, from the Latin solfège syllables sol and mi. The verb "to sol-fa" means to sing a passage in solfège. 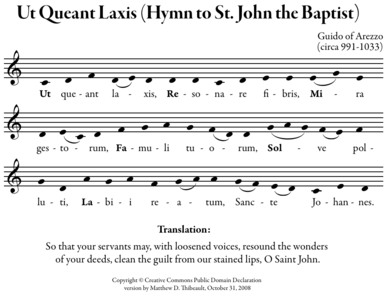 In eleventh-century Italy, the music theorist Guido of Arezzo invented a notational system that named the six pitches of the hexachord after the first syllable of each line of the Latin hymn Ut queant laxis, the "Hymn to St. John the Baptist", yielding ut, re, mi, fa, sol, la. Each successive line of this hymn begins on the next scale degree, so each pitch's name was the syllable sung at that pitch in this hymn. "Ut" was changed in the 1600s in Italy to the open syllable Do, at the suggestion of the musicologue Giovanni Battista Doni (based on the first syllable of his surname), and Si (from the initials for "Sancte Iohannes") was added to complete the diatonic scale. In Anglophone countries, "si" was changed to "ti" by Sarah Glover in the nineteenth century so that every syllable might begin with a different letter. "Ti" is used in tonic sol-fa (and in the famed American show tune "Do-Re-Mi"). An alternative theory argues that the solfège syllables (do, re, mi, fa, sol, la, ti) derive from the syllables of an Arabic solmization system درر مفصّلات Durar Mufaṣṣalāt ("Detailed Pearls") (dāl, rā', mīm, fā', ṣād, lām, tā'), mentioned in the works of Francisci a Mesgnien Meninski in 1680 and later discussed by Jean-Benjamin de La Borde in 1780. However, there is no documentary evidence for this theory. In the Elizabethan era, England and its related territories used only four of the syllables: mi, fa, sol, and la. "Mi" stood for modern si, "fa" for modern do or ut, "sol" for modern re, and "la" for modern mi. Then, fa, sol and la would be repeated to also stand for their modern counterparts, resulting in the scale being "fa, sol, la, fa, sol, la, mi, fa". The use of "fa", "sol" and "la" for two positions in the scale is a leftover from the Guidonian system of so-called "mutations" (i.e. changes of hexachord on a note, see Guidonian hand). This system was largely eliminated by the 19th century, but is still used in some shape note systems, which give each of the four syllables "fa", "sol", "la", and "mi" a different shape. An example of this type of solmization occurs in Shakespeare's King Lear, I, 2 (see § Cultural references). There are two main types of solfège: Movable do and Fixed do. In Movable do, or tonic sol-fa, each syllable corresponds to a scale degree. This is analogous to the Guidonian practice of giving each degree of the hexachord a solfège name, and is mostly used in Germanic countries, Commonwealth Countries, and the United States. One particularly important variant of movable do, but differing in some respects from the system described below, was invented in the nineteenth century by Sarah Ann Glover, and is known as tonic sol-fa. In Italy, in 1972, Roberto Goitre wrote the famous method "Cantar leggendo", which has come to be used for choruses and for music for young children. The pedagogical advantage of the movable-Do system is its ability to assist in the theoretical understanding of music; because a tonic is established and then sung in comparison to, the student infers melodic and chordal implications through his or her singing. Thus, while fixed-do is more applicable to instrumentalists, movable-do is more applicable to theorists and, arguably, composers. Movable do is frequently employed in Australia, China, Japan (with 5th being so, and 7th being si), Ireland, the United Kingdom, the United States, Hong Kong, and English-speaking Canada. The movable do system is a fundamental element of the Kodály method used primarily in Hungary, but with a dedicated following worldwide. In the movable do system, each solfège syllable corresponds not to a pitch, but to a scale degree: The first degree of a major scale is always sung as "do", the second as "re", etc. (For minor keys, see below.) In movable do, a given tune is therefore always sol-faed on the same syllables, no matter what key it is in. The solfège syllables used for movable do differ slightly from those used for fixed do, because the English variant of the basic syllables ("ti" instead of "si") is usually used, and chromatically altered syllables are usually included as well. If, at a certain point, the key of a piece modulates, then it is necessary to change the solfège syllables at that point. For example, if a piece begins in C major, then C is initially sung on "do", D on "re", etc. If, however, the piece then modulates to G major, then G is sung on "do", A on "re", etc., and C is then sung on "fa". Passages in a minor key may be sol-faed in one of two ways in movable do: either starting on do (using "me", "le", and "te" for the lowered third, sixth, and seventh degrees, and "la" and "ti" for the raised sixth and seventh degrees), which is referred to as "do-based minor", or starting on la (using "fi" and "si" for the raised sixth and seventh degrees). The latter (referred to as "la-based minor") is sometimes preferred in choral singing, especially with children. The choice of which system is used for minor makes a difference as to how you handle modulations. In the first case ("do-based minor"), when the key moves for example from C major to C minor the syllable do keeps pointing to the same note, namely C, (there's no "mutation" of do's note), but when the key shifts from C major to A minor (or A major), the scale is transposed from do = C to do = A. In the second case ("la-based minor"), when the key moves from C major to A minor the syllable do continues to point to the same note, again C, but when the key moves from C major to C minor the scale is transposed from do = C to do = E-flat. In Fixed do, each syllable corresponds to the name of a note. This is analogous to the Romance system naming pitches after the solfège syllables, and is used in Romance and Slavic countries, among others, including Spanish-speaking countries. In the major Romance and Slavic languages, the syllables Do, Re, Mi, Fa, Sol, La, and Si are used to name notes the same way that the letters C, D, E, F, G, A, and B are used to name notes in English. For native speakers of these languages, solfège is simply singing the names of the notes, omitting any modifiers such as "sharp" or "flat" in order to preserve the rhythm. This system is called fixed do and is used in Spain, Portugal, France, Italy, Belgium, Romania, Latin American countries and in French-speaking Canada as well as countries such as Bosnia and Herzegovina, Croatia, Russia, Serbia, Ukraine, Georgia, Bulgaria, Greece, Armenia, Albania, North Macedonia, Mongolia, Iran, Taiwan, Middle East, Turkey, and Israel where non-Romance languages are spoken. In the United States of America, the fixed-do system is principally taught at The Juilliard School in New York City and the Curtis Institute of Music in Philadelphia. , not shown above) are all sung with the syllable "do". A dash ("–") means that the source(s) did not specify a syllable. Movable Do corresponds to our psychological experience of normal tunes. If the song is sung a tone higher it is still perceived to be the same song, and the notes have the same relationship to each other, but in a fixed Do all the note names would be different. A movable Do emphasizes the musicality of the tune as the psychological perception of the notes is always relative to a key for the vast majority of people that do not have absolute pitch. Sotorrio argues that fixed-do is preferable for serious musicians, as music involving complex modulations and vague tonality is often too ambiguous with regard to key for any movable system. That is, without a prior analysis of the music, any movable-do system would inevitably need to be used like a fixed-do system anyway, thus causing confusion. With fixed-do, the musician learns to regard any syllable as the tonic, which does not force them to make an analysis as to which note is the tonic when ambiguity occurs. Instead, with fixed-do the musician will already be practiced in thinking in multiple/undetermined tonalities using the corresponding syllables. In comparison to the movable do system, which draws on short-term relative pitch skills involving comparison to a pitch identified as the tonic of the particular piece being performed, fixed do develops long-term relative pitch skills involving comparison to a pitch defined independently of its role in the piece, a practice closer to the definition of each note in absolute terms as found in absolute pitch. The question of which system to use is a controversial subject among music educators in schools in the United States. While movable do is easier to teach and learn, some feel that fixed do leads to stronger sight-reading and better ear training because students learn the relationships between specific pitches as defined independently, rather than only the function of intervals within melodic lines, chords, and chord progressions. Of course, this argument is only valid if the fixed do is used with chromatic solfège syllables. If a performer has been trained using fixed do, particularly in those rare cases in which the performer has absolute pitch or well-developed long-term relative pitch, the performer may have difficulty playing music scored for transposing instruments: Because the "concert pitch" note to be performed differs from the note written in the sheet music, the performer may experience cognitive dissonance when having to read one note and play another. Especially in the early stages of learning a piece, when the performer has yet to gain familiarity with the melodic line of the piece as expressed in relative terms, he or she may have to mentally re-transpose the sheet music in order to restore the notes to concert pitch. Those trained in fixed-do will argue that their act is the analogue of reading aloud in a language. Just as one reads this very sentence without parsing it grammatically, so too fixed-do is the direct sounding of the music. Where the movable-do system requires constant real-time analysis of the tonality and modulations in the score, in fixed-do the musician uses knowledge of the changing tonality to understand for example that the pitch class c-natural is the supertonic in B-Flat major or minor, and the dominant when the music modulates to F-major, but the c-note remains the same pitch. Instrumentalists who begin sight-singing for the first time in college as music majors find movable do to be the system more consistent with the way they learned to read music. For choirs, sight-singing fixed do using chromatic movable do syllables (see below) is more suitable than sight-singing movable do for reading atonal music, polytonal music, pandiatonic music, music that modulates or changes key often, or music in which the composer simply did not bother to write a key signature. It is not uncommon for this to be the case in modern or contemporary choral works. In the countries with fixed-do, these seven syllables (with Si replacing Ti) – rather than the letters C, D, E, F, G, A, and B – are used to name the notes of the C-Major scale. Here it would be said, for example, that Beethoven's Ninth Symphony (in D minor) is in "Re minor", and that its third movement (in B-flat major) is in "Si-bemol major". In Germanic countries, on the other hand, it is the letters are used for this purpose (so that Beethoven's Ninth Symphony is said to be in "d-Moll") and the solfège syllables are encountered only in their use in sight-singing and ear training. 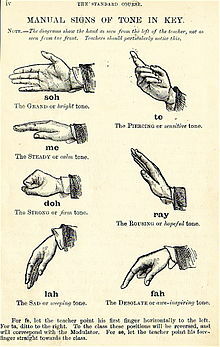 Depiction of John Curwen's Solfege hand signs used in Tonic sol-fa. This version includes the tonal tendencies and interesting titles for each tone. Isaac Newton had associated the seven solfège syllables with the seven colors of the rainbow and surmised that each color vibrated accordingly (a concept possibly related to the modern view of chromesthesia). Thus, red has the least amount of vibration while violet vibrates the most. The various possibilities to distinguish the notes acoustically, optically and by ways of speech and signs made the 'Solfège a possible syllabary for an International Auxiliary Language (IAL/LAI). This was, in the latter half of the 19th century, realised in the musical language Solresol. In King Lear (Act 1, Scene 2) Edmund exclaims to himself right after Edgar's entrance so that Edgar can hear him: "O, these eclipses do portend these divisions". Then in the 1623 First Folio (but not in the 1608 Quarto) he adds "Fa, so, la, mi". This Edmund probably sang (see Elizabethan solmisation) to the tune of Fa, So, La, Ti (e.g. F, G, A, B in C major), i.e. an ascending sequence of three whole tones with an ominous feel to it: see tritone (historical uses). In The Sound of Music, the song "Do-Re-Mi" is built around solfège. Maria sings it with the von Trapp children to teach them to sing the major scale. Solresol, a constructed language that had the solfège notes as syllables and could be sung or played as well as spoken. ^ "Solfège". Oxford Dictionaries. Oxford University Press. ^ "Solfeggio". Merriam-Webster Online Dictionary. Merriam-Webster Online. Retrieved 2010-02-27. ^ "Solfège". Merriam-Webster Online Dictionary. Merriam-Webster Online. Retrieved 2010-02-27. ^ "Solmization". Merriam-Webster Online Dictionary. Merriam-Webster Online. Retrieved 2010-02-27. ^ "Sol-fa". Merriam-Webster Online Dictionary. Merriam-Webster Online. Retrieved 2010-02-27. ^ a b McNaught, W. G. (1893). "The History and Uses of the Sol-fa Syllables". Proceedings of the Musical Association. London: Novello, Ewer and Co. 19: 35–51. ISSN 0958-8442. ^ Farmer, Henry George (1988). Historical facts for the Arabian Musical Influence. Ayer Publishing. pp. 72–82. ISBN 0-405-08496-X. OCLC 220811631. ^ Miller, Samuel D. (Autumn 1973). "Guido d'Arezzo: Medieval Musician and Educator". Journal of Research in Music Education. MENC_ The National Association for Music Education. 21 (3): 239–45. doi:10.2307/3345093. JSTOR 3345093. ^ Miller 1973, p. 244. ^ a b c Demorest, Steven M. (2001). Building Choral Excellence: Teaching Sight-Singing in the Choral Rehearsal. New York: Oxford University Press. p. 46. ISBN 978-0-19-512462-0. ^ Benjamin, Thomas; Horvit, Michael; Nelson, Robert (2005). Music for Sight Singing (4th ed.). Belmont, CA: Thompson Schirmer. pp. x–xi. ISBN 978-0-534-62802-4. ^ White, John D. (2002). Guidelines for College Teaching of Music Theory (2nd ed.). Lanham, MD: Scarecrow Press. p. 34. ISBN 978-0-8108-4129-1. ^ Hullah, John (1880). Hullah's Method of Teaching Singing (2nd ed.). London: Longmans, Green and Co. pp. xi–xv. ISBN 0-86314-042-4. ^ Shearer, Aaron (1990). Learning the Classical Guitar, Part 2: Reading and Memorizing Music. Pacific, MO: Mel Bay. p. 209. ISBN 978-0-87166-855-4. ^ Siler, H. (1956). "Toward an International Solfeggio". Journal of Research in Music Education. 4 (1): 40–43. doi:10.2307/3343838. JSTOR 3343838. ^ Sotorrio, José A (2002). Tone Spectra -and the Natural Elements of Music. (1st Ed) Spectral Music, 2002. ^ Humphries, Lee. Learning to Sight-Sing: The Mental Mechanics of Aural Imagery. Minneapolis: Thinking Applied, 2008, No. 1. Wikimedia Commons has media related to Solfege. Look up solfège in Wiktionary, the free dictionary. "Colours are sounds: How to See the Music", Creativelab. The method for transformation of music into an image.